Since then my husband added some cool new features to the app & it is no longer available in Cydia it is now available in the App Store. 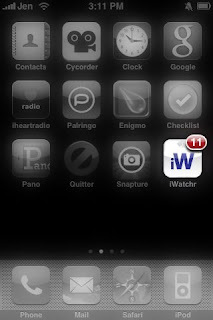 The name had to be changed because someone else took the name (very upsetting) so it is now called iWatchr (without the e). The app still does all the same things as in my old post but with a slightly different look to it & MORE! 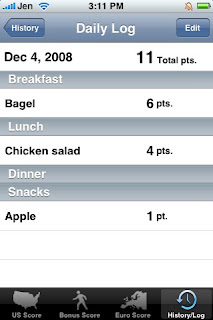 Calculates the points for foods for the United States using Calories, Fat & Fiber. Calculates the points for foods for European countries using Calories or Kilojoules & Saturated Fat. NOW it has a daily log! Enter you foods & the points and it will add up your points for the day at the top. An update was sent into Apple so the daily log is saved each day that way if you had a good week or a bad week you can go back into your log & see what you did for the week. Currently being worked on is a favorites log so you can enter the foods you eat most that way logging will be much faster. Check out DavoliApps for more info. This awesome app for only $0.99!! Click on icon above to bring you to iTunes!